Are you afraid of the dentists? Or maybe you are a dentist yourself? 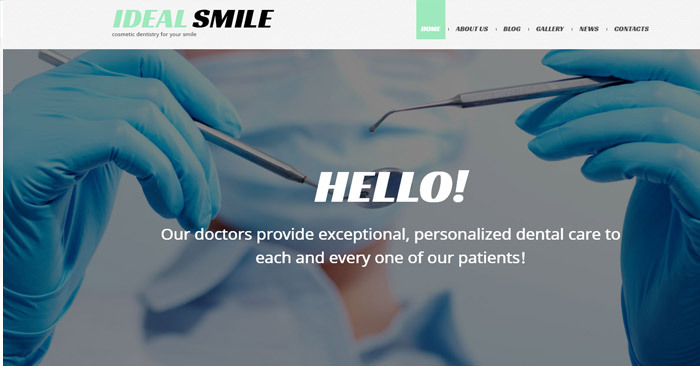 Would you like to present your dental clinic online? It’s a wise solution, if you do everything properly, you will draw much more visitors to your clinics, convert them into loyal customers and become not only a good doctor, but a well-off businessman. Everything said above is absolutely real and is simpler to reach than you might think. 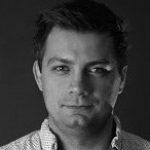 You don’t need to invent anything, hire a designer, invest heaps of money in order to launch your project. Times when it was difficult and expensive to build a website are left in the past. Now absolutely any entrepreneur has such possibility. The level of your technical expertise doesn’t matter. 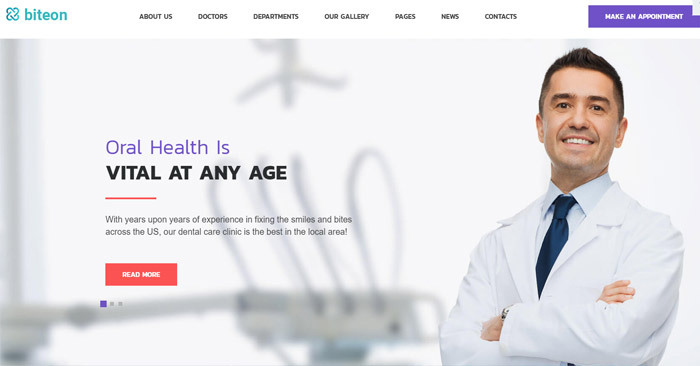 If you are not skillful neither in web design nor web development, if you know nothing about the current trends and techniques, use one of the ready-made dental clinic WordPress themes showcased in this article. You can’t even imagine how much time a professional template can save to its owner! Using WordPress is a win-win solution itself. The CMS is free and open source. 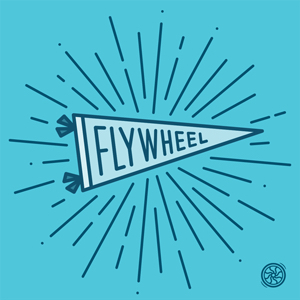 Hundreds of geeks all over the world work on its improvement day-by-day. You can create absolutely anything on the bases of the platform: from personal blog to medical clinics site. What’s more, the CMS is fully customizable and highly extensible. You can use thousands of free plugins available on WordPress.org for the purpose. 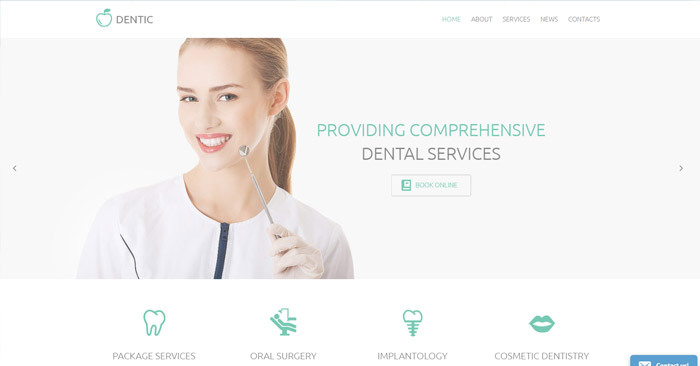 But let’s come back to our best dental care WordPress themes. They were created by TemplateMonster.com, one of the well-known industry leaders. These guys have 15 years of experience on the market, 26 000 of templates developed for most popular business niches and engines in stock, and millions of satisfied customers. You can become one of them. The company tracks the latest web design trends and technologies and invents their own to apply them in their products and cater to your need better. Their templates are easy to install, customize and maintain. All you need to do is replace the default content with your own, play with colors, make minor tweaks here and there and you are ready to go. Not sure if you can cope with all that stuff? It’s not a problem, just order the customization service at TM Service Center and your website will be delivered to you within 24 hours. The team has been designing and developing various templates based on different platforms for years. No doubt, they know their products excellently. They will free you from worries and transform any template of your choice into a unique website. TemplateMonster’s Service Center mission is taking your favorite concept from a template and reshaping it into the website that is a complete realization of your ideas. Please have a look at this tool: TM Reviews generator. It will help you raise trust to your company and its products. This will be especially useful for TemplateMonster’s affiliates or those who are planning to become the ones. 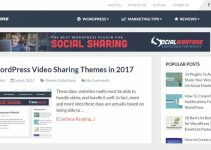 We think we have told you enough about WordPress themes, their provider, and benefits you get purchasing them. So, it’s a good time to take a look what’s in store for the dentists today. 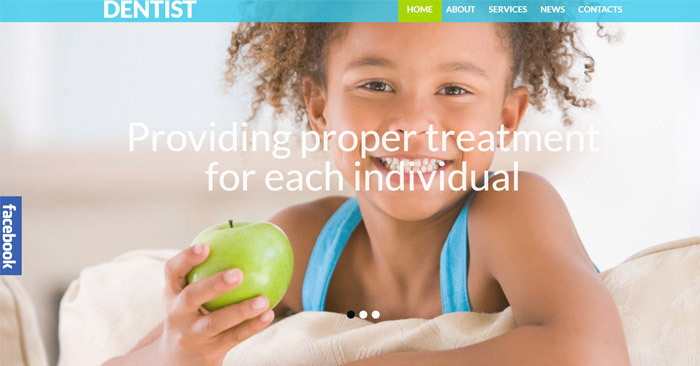 The theme has a clean positive layout designed in bluish colors traditional for medical websites. It is equipped with drag-and-drop page Builder. It allows you to build pages easily even if you don’t know much about coding. However, that’s not all. You can take advantage of more than 25+ modules, library of presets, and drag-and-drop functionality. You will be surprised how easy you can customize the design of your theme with an advanced set of configuration options. This clean, minimalist theme is designed in metro style. It is supplied with Cherry Services plugin. 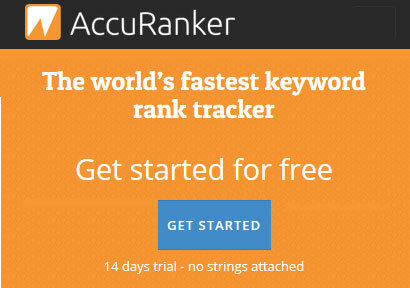 This powerful WordPress plugin allows to present your services in a professional way. Shortcodes are available to quickly insert the customizable widgets into any area of your website, be it a single post, a gallery, or even a dedicated page. The services created with the help of this plugin are highly customizable. This allows you modify their look with just a couple of clicks. If you want to create a trustworthy website, Cherry Team Members will become really handy. It will make your site look truly reliable and professional. Design, navigation, and cool widgets highly matter, but your team is what makes your clinic special. Cherry Team Members plugin is exactly what you need. Feel the importance of your team member’s presentation and share all the details about your team’s bio with your customers in the most stylish way. 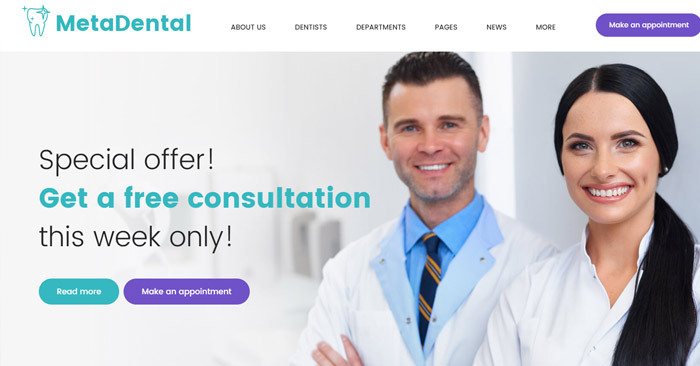 The theme has a very welcoming design with all those images portraying smiling doctors. However, it is not only appealing, but feature-rich. For instance, the theme is delivered with Cherry Search. Improve the usability of your website dramatically with this plugin for WordPress. Intuitively simple and fully customizable, Cherry Search is seamlessly compatible with WooCommerce and is perfect for all kinds of websites: blogs, magazines, portfolios, online stores, and many more. The plugin is based on AJAX technology, allowing your visitors to browse the quick search results without leaving the page. This modern theme gives you the opportunity to choose from a large set of layout options and experiment with your page structure. Speed up your building process by saving your favorite layouts in a built-in library, and use them whenever you need to create a new page. 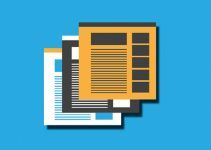 Use content modules to add multiple content types to your page. This includes buttons, images, pricing tables, contact forms, sliders, and many more. Each of them has an extended set of options that you can tweak to match the style of your website. 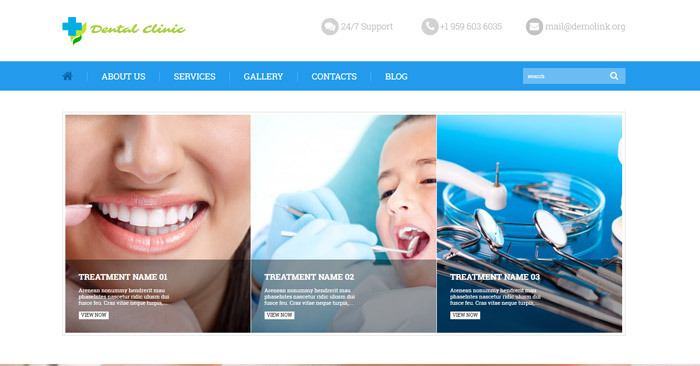 The design of this dental clinic theme is fully responsive. That’s a must nowadays as Internet users don’t want to be limited by the choice of a gadget. With this theme they won’t need to, as your website will look same perfect on any handheld device screen. You can edit your theme according to your taste, preferences and corporate requirements. Tweak the slider, change sidebar position, typography, and so on. Use custom post types and post formats to present your content the best possible way. The design of this theme is minimalist, clean and clear. The author uses neutral photos and simple understandable icons. The theme is multilingual ready and officially WPML certified. This will help you render your services internationally. It seems like the theme offers a shortcode for each and every need you might have. This considerably simplifies and speeds up the process of its customization. If you are looking for visual appeal and simplicity, choose this theme. You can install it in 2 steps only. Multiple color options will let you change the hues of your website and make it one-of-a-kind. The theme is delivered with filterable portfolio and fantastic sliders, so your website will have nice visual presentation. The theme is SEO ready, which means that your website will have high Google rankings. Free, lifetime updates will help you keep your website current for years to come. 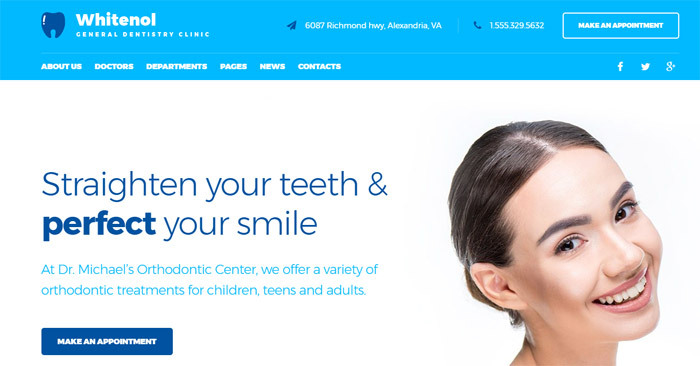 The theme greets the visitors with a full-screen slider where you can show the photos from your clinic. Main menu of the theme has lowered position on the page. It sticks to the top as you start to scroll down. This way main navigation is constantly before the users’ eyes and people can easily skip from one page to another. 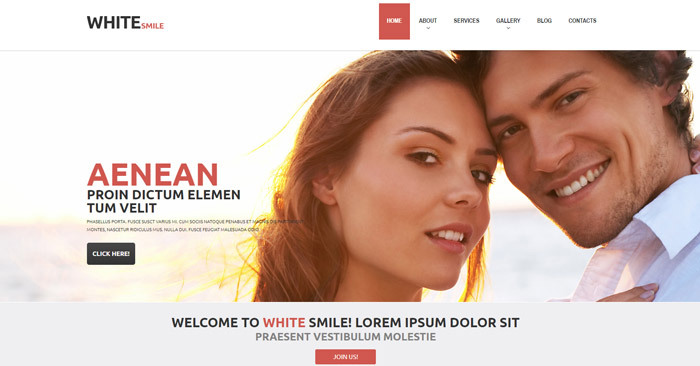 The theme is equipped with parallax effect, which adds an illusion of depth and perspective to the layout. Lazy load effect is also a huge benefit as it makes the theme load faster. 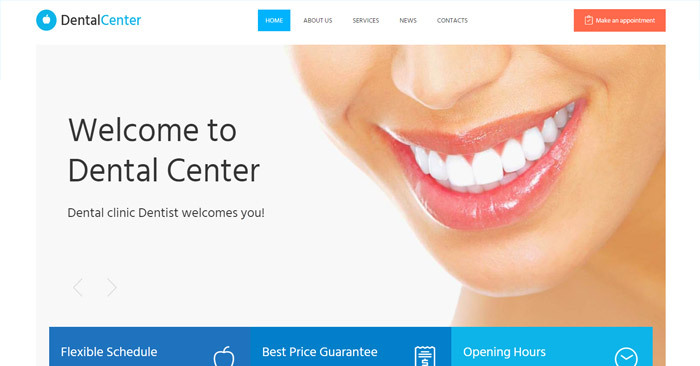 If you want your dental clinic to have a classic, time-tested look, choose this theme. It will impress your visitors with stunning transition effects applied to slider images. 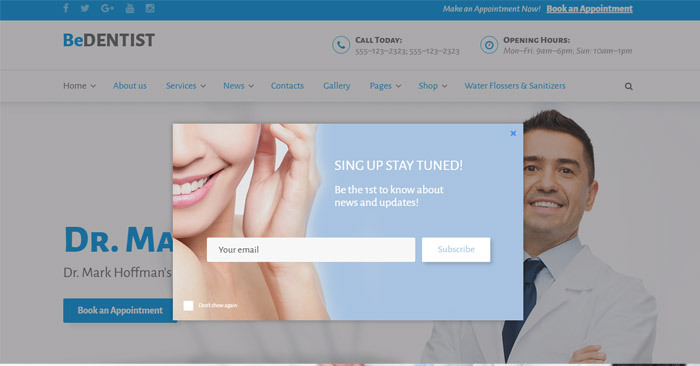 Famous clinic partners’ logos are featured right under the slider and serve as one of the trust signals for the users. Major company services are placed on banners. This enhances overall website’s navigation. There is a registration form at the bottom of the page. It allows the users get a free professional consultation of one of your doctors. 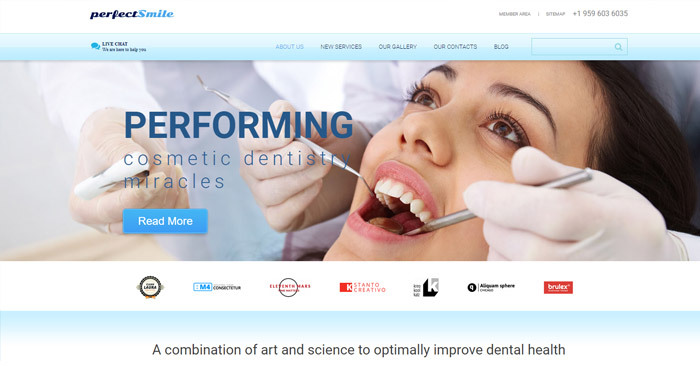 If you are looking for a mega-positive theme for your dental website, we recommend you to consider this one. It is designed in bright, cheerful colors that impart the layout a fresh, positive look. The theme is powered by Cherry Framework. It is a simple, accurately crafted framework that offers you easy installation, solid Bootstrap options, numerous shortcodes and widgets, etc. The theme is integrated with advanced SEO support. This allows managing page meta data and heading tags. SEO optimization will make your website easier to find on the web. The theme is rather content-rich, but its layout doesn’t look cluttered. 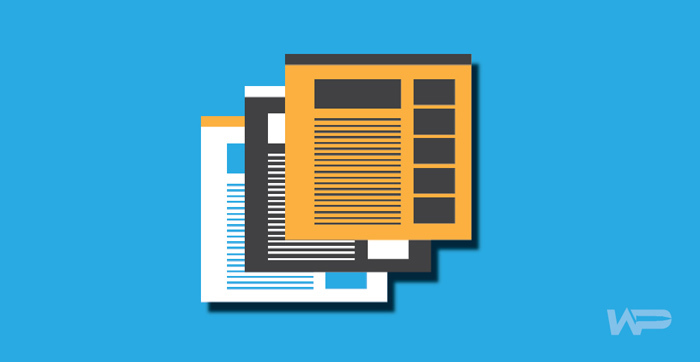 Text styling: headlines, lists, icons, and images help to keep the page clean. Banners are supplied with hover effect, which makes the layout dynamic. 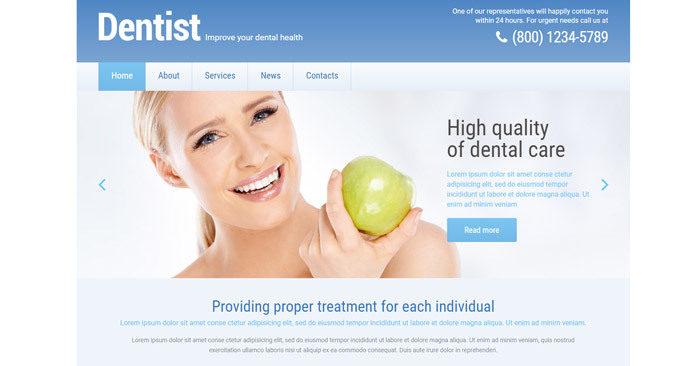 Happy clients’ testimonials come with images and make the web page appear more trustworthy for the patients. Additional navigation links can be found at the footer. The theme is also delivered with Google Maps. 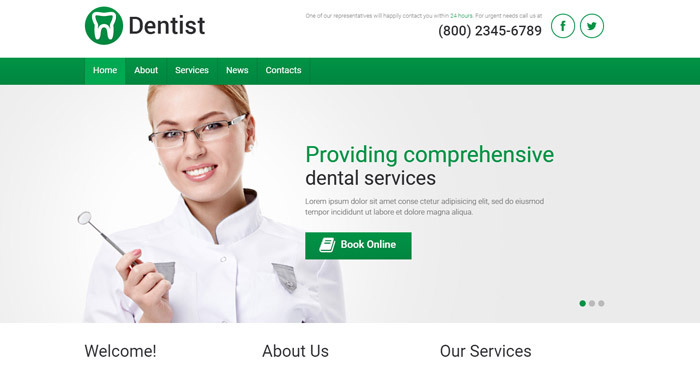 This is a simple theme to feature your dental services the best possible way. Green and white colors make perfect combination. Main menu of the theme is sticky, with is very usable as it constantly stays at the user’s hand. Slider images come with explanatory texts. Site content is arranged in three columns with the usage of subtle lines, frames, lists, etc. Banners respond user actions on mouse over, which makes the web page interactive. 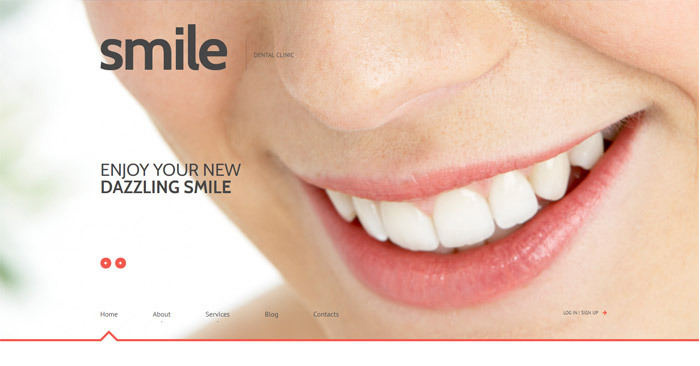 The theme includes image slider that displays so many happy and healthy smiles. Slides are accompanied with text. Site navigation is thought out. Main menu has drop down option, which helps to save the space on the page. Clinics offers are featured right under the slider. The theme also contains Latest Posts, Why Choose Us, Testimonials, and other sections that will help you tell more about your clinic. The template has a very pleasant color scheme and simple, yet efficient structure. 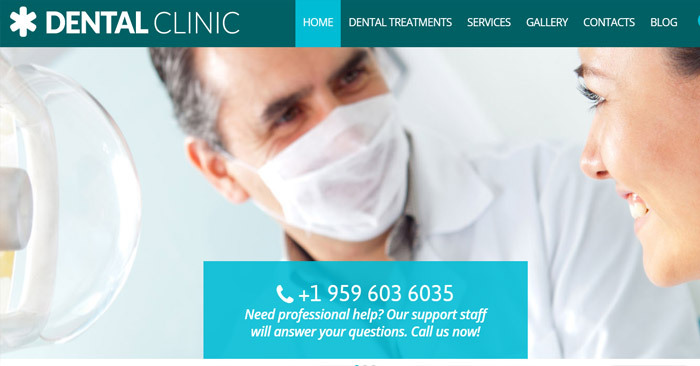 Header includes not only clinics logo, but its contacts either. Main menu has drop down option, which helps to save the web page from clutter. Slider images feature people with perfect smiles. Each slide is accompanied by text and call-to-action button. The rest of site content comes in three column structure and is styled in a horizontal list, which makes it easy for scanning. The theme has a rather uncommon structure. It has a big header featuring a beautiful smile. 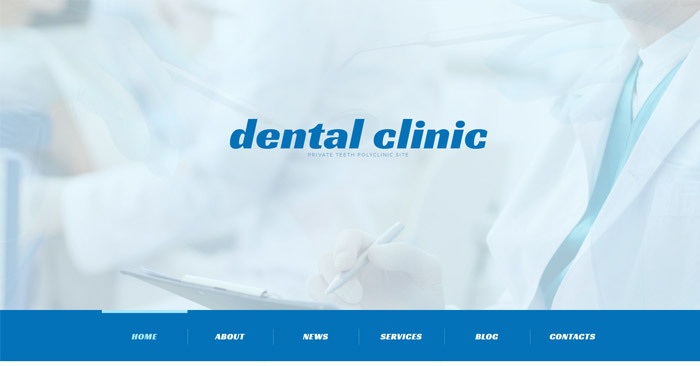 Clinics logo and small text slider are placed over it. Main menu has lowered position under the header image. It comes with an interesting animation effect. Big headers and cute icons make site content easier to perceive. Back to top button is available at the right bottom corner of the web page, so you don’t need to scroll all the way up to get to the main menu. 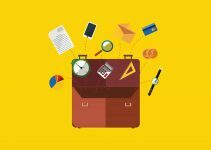 I was just searching google around and found your this amazing article for Lawyer WordPress Themes for Attorneys. Such a nice post, it includes some good themes indeed. I am Jitesh fron NavThemes and we do have a pretty amazing free theme for lawyers too. So I would request you to consider this to including in that listing, Please let me know what you think.